From my own experience with Creation Books, it seems as though these issues either stem from willful ignorance or gross incompetence (although one certainly doesn't preclude the other). I would advise that anyone who chooses to request a refund be civil yet firm. Late last year, I was trying to track down a replacement copy of Ultra Gash Inferno. Creation, via a third party, offered to furnish the book at the market price for a first edition. When the book finally arrived, both the cover and interior art seemed to have been printed from low-res PDFs, with artifacting on the cover's display type and unsaturated blacks appearing throughout the interior. Furthermore, uncoated stock and a shoddily glued spine (that also showed fold lines) hinted that the book may have been a print-on-demand job from old files rather than the coated stock, perfect-bound original printing for which I had agreed to pay a premium. 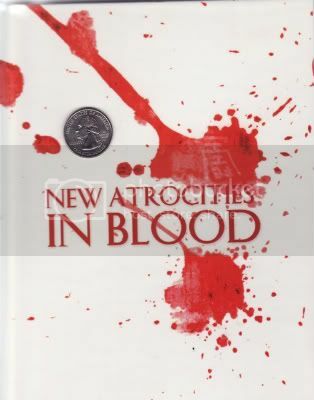 Creation's response follows; I'm only posting it because it seems to echo the "we're not aware of the specs on books that we publish or distribute, and we don't see how quality control is a real issue" sentiment on the New Atrocities in Blood "debacle." "There were two editions of the book, one in the UK in around 2000, the other in the US. We've never had copies of both to compare, but it's possible one edition was different to the other. Both were sold throughout the world without complaint though - this just seems to be a case of "comparisons are odious". So not sure what we can do about it." a copy ourselves yet but will check it out as soon as possible." "We are not the publishers of this book, only vendors. and we will refunds the purchase money. Sorry to hear of this problem." So yeah...refunding. I still feel sad though, this could have been great. @myrto: That is certainly interesting... From what folks are saying, I would get the specifics and timing of the refund worked out in writing before you send the book back... just to make sure it's all clear with them. This doesn't surprise me. I advise all readers of this to avoid buying any books from Creation and if they have to, to order the titles from a bookshop where they can at least return their purchase. I run a small distro and have been innundated with messages from buyers describing the shoddy service they have received from 'The Rabbit' who handles Creation's mail order. the guy appears to have no understanding of 'customer service' and I have even heard reports of him refusing to issue refunds when books have arrived damaged, not atall , or in one instance, the wrong order! This latest saga does not surprise me. Creation used to be a great publishing house so it is a shame they now appear to have cretins and bullshitters working for them. @anonymous: Yeah, this is not surprising and confirms everything I've heard. I can't really imagine doing business with them, and I would never order anything from them after this. The fact that they don't even give a full name and phone # is just one of a LOOOOOONG list of problems. I hope folks google them and see this post and know these details before making their decision to buy anything from them.